In Book Four of Richard Foreman’s brilliant Raffles series, the gentleman thief returns in two scintillating stories there are sure to delight fans of both the original and the new stories. 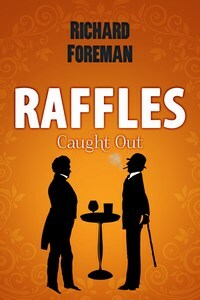 Raffles: Caught Out follows on from the events of Raffles: A Perfect Wicket. Harry “Bunny” Manders returns to London to find a message in his apartment from Raffles, summoning him to the Albany. Their mutual friend “Ranji”, the great batsman of the age, has been compromised by a beautiful and mysterious widow, Iris Adams. Their task is to retrieve a ruby ring in her possession – and if diplomacy fails Raffles vows to use his skills as a cracksman. Yet has he met his match in the captivating Iris Adams who, like Raffles, possesses a secret? Will our hero finally be caught out? Raffles: Stumped takes place before Raffles: The Gentleman Thief. Although Harry “Bunny” Manders has worked a few jobs with Raffles he still finds himself in debt. Bunny must pay off a loan to an unscrupulous moneylender, Alexander “Shylock” Cardinal, or else lose all of his assets, or worse his life. Bunny puts his faith in his best friend to save the day but can even Raffles pull off a job at such short notice – and raise such a large sum of money?